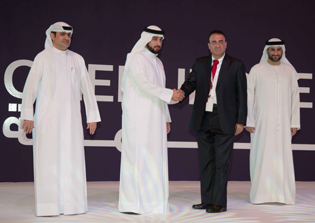 Orient Planet, one of the fastest growing marketing and communications consultancies in the Middle East, was listed at the 2015 edition of 'Top 100 Small and Medium-sized Enterprises (SMEs) in Dubai' during the Dubai SME 100 Announcement Ceremony recently held on November 15, 2015 at Madinat Jumeirah Arena, Dubai. Orient Planet was ranked 31st among top 100 SME companies in Dubai. The company was chosen from over 4,000 companies nominated within the emirate after a screening process by a distinguished panel of judges. H.H. Sheikh Ahmed Bin Mohammed Bin Rashid Al Maktoum extended his congratulations to this year's list of winners in front of an audience composed of key influencers in the SME sector. The Dubai SME 100 was developed to cultivate more support for the SMEs and to ensure their growth into world class, globally-oriented companies Launched under the patronage of H.H. Sheikh Hamdan Bin Mohammad Bin Rashid Al Maktoum, Crown Prince of Dubai and Chairman of the Executive Council, the program was established in recognition of top-performing SMEs that have positively contributed to the emirate's economic well-being and expansion. Nidal Abou Zaki, Managing Director, Orient Planet, said: "It is an honor for our company to be included among the top 100 SMEs in Dubai. This recognition reflects our group's steadfast commitment to provide unparalleled services to our clients. We have always believed that success is based on three main pillars: quality management system, which we are dedicated to enhancing across all aspects of our operations; the trust and support of our customers, which we are very grateful for; and, our employees, whom I would like to thank for their tireless efforts within the company. This achievement will serve as further encouragement as we strive to create new benchmarks of excellence, pursue innovation and continuously expand to take on more challenging projects in the future." Small and Medium-sized enterprises play an important role in the economy of Dubai. According to a report by Dubai SME, the agency of the Department of Economic Development, SMEs constitute 95 per cent of total business establishments and contribute 40 per cent of the emirate's Gross Domestic Product (GDP). In addition, SMEs account for 42 per cent of the total work force. They have been widely regarded as a fertile ground for innovation, and an essential element of the growth and development of the private sector. Orient Planet features a wide and diverse portfolio that includes distinguished clients from various industry verticals such as government organizations, information technology, exhibitions and conferences, consumer electronics, telecommunications, property and real estate, healthcare, aviation and transportation, energy, automotive, banking and finance, education, and the marine segment. Specializing in creative communications, Orient Planet offers a range of dedicated PR services in English and Arabic through customized marketing campaigns that address the client's particular needs.  Orient Planet is headquartered in Dubai, UAE, and has a wide network of offices that extends across the Gulf, Levant, Egypt, and North Africa.